Interior designer, retailer, style spotter and influencer Jeanne Chung shares her thoughts about creating retail spaces, engaging customers and attracting designer business. Furniture World spoke with Pasadena-based interior designer Jeanne Chung. Training at Parsons School of Design and the New York School of Interior Design, Jeanne developed her skill at blending classical design with fresh contemporary elements to create spaces that seem more to have evolved than to have been fashioned. She has been a Style Spotter for the High Point Market, a design blogger, and owner of the Cozy•Stylish•Chic retail store. Tell us about your path to becoming a luxury interior designer, furniture retailer, trend spotter and design influencer. “I’ve always been interested in design. In most Asian cultures, that might have been a problem, with parents steering their children away from becoming fashion designers and into business or medical fields. My family was in the ready-to-wear business, so their hope for me was to someday take over the family’s manufacturing business. “We manufactured in Bali, an amazing place. So early on, I was exposed to beading, embroidery, wood carving, Batik and Ikat – all of which have influenced my interior design work. I was immersed in art pretty early on, with summers spent taking color classes at a local college. In high school I took weekend graphic arts classes at ArtCenter College of Design here in Pasadena. “I attended Washington Univ-ersity in St. Louis for just over a year, then decided to switch my focus from fine arts to fashion design. The best schools were Otis-Parsons in Los Angeles, Parsons School of Design in New York, and Parsons in Paris, at the time all related. I started out in Los Angeles, then transferred to Parsons in New York City. Upon graduation, I worked at the Anne Klein Design Studio in New York City, then Norma Kamali, before returning to LA to work in the family business for 20 years. “It wasn’t too long before I started writing a design blog. I attended my first Design Bloggers Conference, where everyone talked about High Point. So, I booked a ticket to North Carolina without knowing what to expect. Wow! I was like a kid in a candy store. “At my first Market, I took snapshots of all my favorite showrooms, and recall seeing little cards on all the cool pieces of furniture that read, “High Point Market Style Spotter." When I returned home, I wrote down my observations. The following year, I heard that the High Point Market Authority was looking for Style Spotters and, not knowing any better, I thought, ‘What the hell, I'll throw my name in the hat.' Looking back, it's kind of hilarious. Style spotters generally have lots of followers or are design celebrities, and at the time I probably only had about 50 Instagram followers. “By the way, I later agreed to lead the High Point Market Insider’s Tour because High Point is so daunting for the average first-time visitor. A lot of first-time buyers arrive at the transportation terminal and just don't know where to go. To have somebody who knows the lay of the land and can give the uninitiated a one-day overview of the market is invaluable. You said that you bridge classic design principles with a modern twist. Tell us more. “A while ago I heard designer Bunny Williams give some advice that still resonates. She suggested that designers train their eye by looking at the best. Go to museums, visit show homes. When we take in something beautiful, we absorb its proportion, its balance. It becomes a part of us. Only then, when we see something that's off balance – we may not know exactly why – but we will know it needs correcting. That is a great first step. What were your reasons for opening a retail store? “There were a couple of reasons. As a High Point Style Spotter, when I posted a great piece on Instagram, people started asking me where I saw it, and where they might buy it. “Also, after starting my interior design business, I visited a big furniture store in Pasadena, introduced myself, and asked if they worked with independent designers. A store representative explained that I was welcome to buy, but at the same price as any other customer. I thought that was ridiculous and the experience prompted me to open my own place. “Our retail operation is only 1400 square feet, showcasing a nice mix of furnishings, accessories and art. Most of what we do is custom. The store is open to the general public, but as a result of my social media following, over time I started attracting more designers. Consumers usually want to see products on the floor, buy, and be done with it. But designers are all about custom. They are used to going through catalogs and expect to see a huge selection of fabrics; they rarely buy floor samples. “Our retail model evolved in part because dealing with designers is a lot easier for me than dealing with end consumers. Maybe that’s because I know how designers think, have experienced their challenges, and understand what types of difficult-to-find products they want to discover. “Cozy•Stylish•Chic offers personal attention and education; we maintain a space where designers can share ideas and work together. We frequently host ASID events, and work with companies like Benjamin Moore, that introduced its new paint line called Century, and Sony, that launched their Life Space UX series of smart home products." Were you already a luxury kind of interior designer when you opened the store? “I've always known quality. That's an attitude handed down from my mother who told me to always buy the best that I could afford; to value quality over quantity. 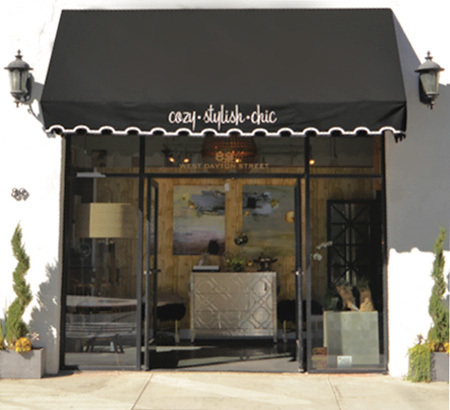 “Becoming known as a luxury designer really started to happen after I opened the Cozy•Stylish•Chic retail store. The store put a spotlight on my design sensibility, which, in turn, drew in clients attracted to that aesthetic. “One reason our business has been successful is because we know how to tell stories. Cozy•Stylish•Chic is a tiny store, but we often outsell huge venues because products don’t just sit there on the floor waiting for people to buy them. We take the time to demonstrate. We tell a story. We engage with customers. Bigger isn’t always better! “I find the average retail furniture store experience frustrating. When I walk into stores, it feels like sales associates often just discount the fact that I’m there. Maybe they don’t want to be pushy, but they act as if they are purposely ignoring me until I either go away or ask a question. “Foot traffic is valuable. When a consumer or interior design client walks into my store, if we don’t initiate contact, learn about them, their wants and needs, we have missed an opportunity. “Often interior designers ask how they can work with us. We usually give them a design packet and ask them to provide project specifics. But before they leave, we try to get to know them, their style, and ask to see pictures of their projects. It’s the same thing we do with consumer-shoppers. We ask about their favorite furniture pieces, color-scheme preferences, and budget. These opportunities are important. “We often outsell huge stores because we take the time to demonstrate. Are there opportunities for most retailers to do more with interior designers? “Yes, there are definite advantages to furniture retailers in working with the interior design community. The sales process, especially for custom furniture, requires a big investment of time. While consumers who purchase high-quality furniture may not come back for 10 or 20 years, designers will bring in consistent business. Margins are lower, but there’s more volume. “Interestingly enough, the retailer I mentioned before who refused to offer me trade discounts, surprised me by calling a couple of months ago to ask if I was working on any projects they might help with. Times have changed and furniture retailers need to change with them. Just because a policy worked 50 years ago, doesn’t mean the same strategy will work now. Competition from the Internet and other channels of distribution have changed all that." Where do you see the biggest challenges for both retailers and designers? “The biggest challenge is that everything has gone online. I always tell designers who take my Insider’s Tour at High Point Market to stop selling what’s easily available online. I made that mistake when I first opened Cozy•Stylish•Chic, believing that I had to offer lines that everybody knows. I soon found out that I didn’t want to play the discounting, price-matching game. People would come in, and snap pictures and go home to order online. Now I offer unique products, quality products that can be customized. “Today, business is changing fast and retailers need to keep current to anticipate changes in the marketplace. Take for instance Dering Hall and Chairish, Inc. joining to create the largest online platform for high-end home furnishings in the country. And then there is the expansion of 1st Dibs beyond antiques, to work with furniture companies and artisans. “Most furniture websites fail to tell a compelling visual story. I want them to show me more than just images of a bunch of sofas and case pieces. I want them to give me a reason to come into their stores. “As I mentioned before, retailers often fail to interact appropriately with customers. It’s never a good idea for retailers to pre-judge customers and think, ‘Yeah, they're not gonna buy anything, why waste my time?’ You can't have that attitude! You can’t judge by the way shoppers are dressed, because it’s just as likely that they've got a big wad of cash in their pocket and are motivated to buy. “You absolutely have to establish rapport, spend time with them, take time to demonstrate fabrics and construction. They may buy from you this time or find what they want somewhere else, but later on down the road they'll come back because they will understand your passion for the industry and what you do. Let’s talk about how consumers have changed. “There's a big difference in how younger people shop. Everyone knows that millennials tend to want instant gratification. They want it fast and it's got to be in stock. For that reason, Cozy•Stylish•Chic has made an effort to find and work with brands that are set up to warehouse and can ship quickly. "Baby-boomers want quality. Often, they're looking for brands they recognize; that’s why Thayer Coggin is an important supplier for us. Cozy•Stylish•Chic displays some expensive lines, and shoppers can be surprised by the prices, telling us, ‘Oh gosh, that's expensive!’ I’ve often explained that what we offer is an investment in quality, and advise them to go online, check out a vintage site where they will see how these kinds of pieces retain their value. Then, I further explain how buying a cheaper knock-off can end up being more expensive. Where do you see transformative design leadership coming from? “Unfortunately, I see a lot of design leadership coming from social media, from people and celebrities who know what they like, or get paid to endorse products, but don’t have much interior design training. Where do you see style going? Are there any strong trends developing now? Do you have any words of advice for retailers about how to spark renewed foot traffic? “Retailers may need to engage a designer or local influencer to add a new perspective to their offerings. “Basically, influencers are people who have an online following. Often, they are paid to promote products or services. Some, like Kim Kardashian, have large Instagram feeds. But there are also influencers, like me, who use knowledge to educate and really bring to bear a unique perspective that can help a manufacturer or retailer to make products look more attractive, fresh and new. “Influencer arrangements can be win/win for designers and retailers. Let’s say a designer/influencer agrees to style an area of a retailer’s showroom, make a personal appearance and provide social media support. The designer gets publicity and perhaps other consideration. The retailer benefits by attracting the attention of the influencer’s followers, which can bring awareness and also foot traffic into the store. Sometimes a simple Internet search for a list of local designers is enough to get started. “There are many opportunities for useful collaboration in our industry. 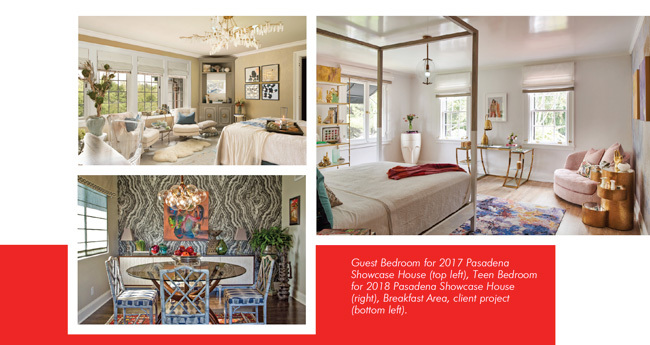 I’ve worked with Alden Parkes and Twin Star Home, designed booths for the WestEdge Design Fair, participated in showcase houses, launched products on the West Coast for Sony, Benjamin Moore and others. “Here's the important part about collaboration: nothing ever comes for free. There has to be give and take in any relationship. As long as the partners keep that in mind, it's a win/win for everyone involved.